You can easily load your custom review content into any project in your account. Your review can be built using your custom content only, or you can use a combination of your content and the content available in EchoSpan's standard library. There are two method's available to add your content. Click the "Add New Competency" button on the left side of the review items page. Type in your competency names, separating each new competency by a line break or copy and paste the list of competencies in from a word or excel document. 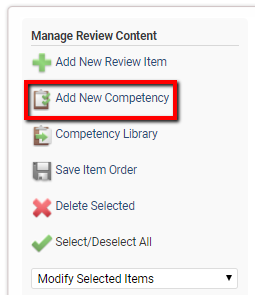 Now that the competencies have been added, you can add multiple items to a competency at a time by clicking the "Add New Review Item" button on the left side of the review items page. The items should be separated by a line-break and can be copied in from a word or excel document. Make sure to select the category you want to add them to from the category drop-down box. If you would like to add your items one at a time, click the "New Item" link next to your category name and type in or copy and paste in your item and edit the item settings as needed. Once the items are entered you can click the "Copy to library" option next to the category name to copy that category and its items to your custom library for use in future projects. Click Competency and Item Uploader. Download the Excel template used to map your review content to the format needed for an upload. Map your content to the Excel form. Choose if the content you are uploading should be added to existing items, or if it should replace any existing items. Paste your review content into the space provided.